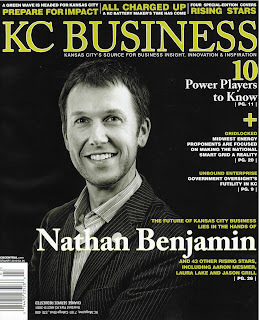 KC Business Magazine's "Rising Stars" - Inaugural Edition. In the latest volume of the KC Business Magazine, 44 brilliant business minds were featured as the people-to-watch, or, "Rising Stars" of the KC metro area. Of the group, 4 were chosen to grace the special-edition covers of the magazine. Among the 4 was PlanetReuse's own Nathan Benjamin along with Aaron Mesmer of Block LLC, Jason Grill of King Hershey PC, and Laura Lake of Laura Lake Consulting. To learn more about the "Rising Star" inaugural edition and the selection process, continue reading. "They are young, ambitious and driven. They are the bright minds that push their organizations to do more, go farther and think bigger. They are the rising stars of business in Kansas City. And they are all on the fast track to the top. How do we know? Because every person honored in our first-ever KC Business' Rising Stars class has already demonstrated his or her ability to steer around obstacles, overcome challenges and seize opportunities on the path to prosperity. The people featured in the pages that follow know where they are going and what it takes to get there. They represent the future of Kansas City business and ensure that future is going to be a bright one. It's a foregone conclusion that you will hear more from these men and women in the near future, but consider this your introduction." To continue reading the entirety of this month's volume of the KC Business Magazine, click here and scroll to Scribd page 28 (or page 26 in the KC Business. *Note: The uploaded Scribd cover is just one of the four optional covers from the current volume, or special edition, of the publication.